In a large bowl, lightly beat the eggs. Add all remaining ingredients. Stir until well combined. Let mixture set at least 10 minutes for oats to absorb some of the liquid. 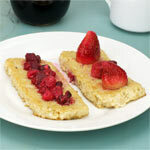 To serve, cut into squares and drizzle each serving with maple syrup. 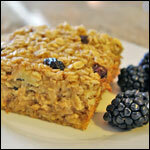 Easy to make oatmeal that you can cut into squares. It's sort of like an oatmeal coffee cake, but it has no flour or sugar. For a terrific breakfast, serve warm with a drizzle of maple syrup. 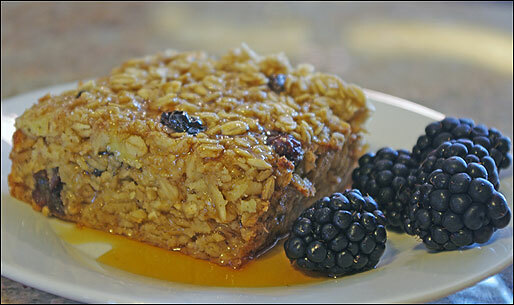 What do you think of Baked Banana Raisin Oatmeal? Easy. Amazing. I love it. We substituted EV coconut oil for a healthier fat. We also used dried cherries instead of raisins and added walnuts. 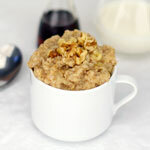 I LOVED this recipe and I typically HATE oatmeal. I might top with maple flavored yogurt at table next time. Would omitting the bananas affect the consistency? 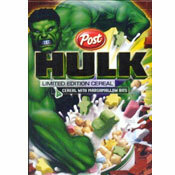 Delicious and great for the kiddies. This looks amazing! I'm going to try it tomorrow, but will probably use applesauce in place of the oil... just to see what it does... as well as throw in some flax seed. Do you have to store in the fridge after or can you leave it out? Yum! I do not put in any honey. I put only 1 Tbsp agave nectar. I also substitute in various different berries I have at the time. The entire pan yields the following nutritionally: 3 servings of protein, 6 servings of fruit, 6 servings of grain 1.5 of dairy, 4 servings fat. Comes out like combination of oatmeal and coffee cake. 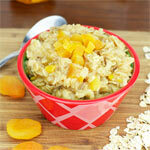 We liked it a lot, but for the extra time and effort, regular oatmeal on the stovetop is just as good if not better. I love this recipe, I already made once. Is there any nutritional analysis available for this recipe? ?